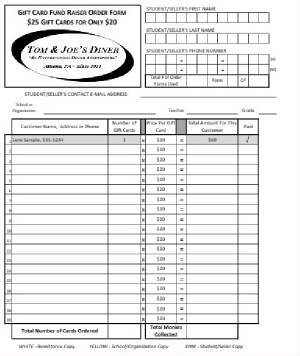 This fund raising opportunity provides a method for your group, charity, or organization to raise money simply by selling discounted Tom and Joe's Gift Cards. We provide the forms for each member to use. Each member of your group will pre-sell $25 Gift Cards for the discounted price of $20. Once the sale ends and we receive all of the order forms, we will provide the Gift Cards for each person to distribute. The more your group sells, the more money your group or organization receives. Call for more information and ask for George.